Today was a simple but good dinner. As I described a few days ago, we had gone out to a South Indian restaurant on Sunday and I had ordered a spring masala masala dosa, a lentil-rice crepe filled with vegetables. The dosa was cut into quarters and I brought two of the quarters home - my wife and I each had one of the pieces with our dinner tonight. I heated the dosa up a little too much in the oven, and it became overly crispy and dark, but was still good. Just before dinner, I had purchased a New Mexican chile pepper. I roasted it lightly (I put it directly on flame and gently charred it - normally I char pepper throughout to get it all black - then let it sit for a few minutes - normally I put it in a brown or plastic bag to let the smoke flavor permeate and continue cooking the pepper from inside-out - before rubbing it under running water to tease off the burned skin; then I simply sliced it in half longitudinally and removed the seeds and membranes) and filled it with quinoa that I had made with broccoli. I served the broccoli on the side. My wife wanted to prepare okra. She washed and dried okra, cut it into thin vertical slices, and sauteed with mustard seeds, dried red chile, ground cumin, ground coriander seed, and a little lime juice (instead of the lime juice, she would have preferred using amchur, a spice made from dried mango, but we were out of it). She cooked the okra over low heat then added a little salt to taste. My friend who moved away this week left me some avocado oil; I have used avocado oil only a few times, about five or more years ago, when I bought a bottle of it. It has a thick consistency, little flavor, and is high in monounsaturated fats ("good" ones that help to reduce LDL cholesterol). I used a little bit of this oil to grill asparagus spears in my cast iron pan. I also put a little avocado oil into a large stock pan and briefly sauteed some onion cut into half moons and a few chunks of garlic, then I added braising greens and salt, reducing the heat to low and covering the pan. I occasionally mixed the onions and greens and cooked for a total of about 6-8 minutes more. I also served some seeded ciabatta bread, toasted and then topped with artichoke tapenade. I roasted some corn on the gas range flame, removed the kernels with a knife, and mixed in a few spices, Earth Balance non-hydrogenated margarine, and small cubes of onion. My wife liked this combination, but I found some of the corn was damaged and I thought the resulting ratio had too much onion to the usable corn. 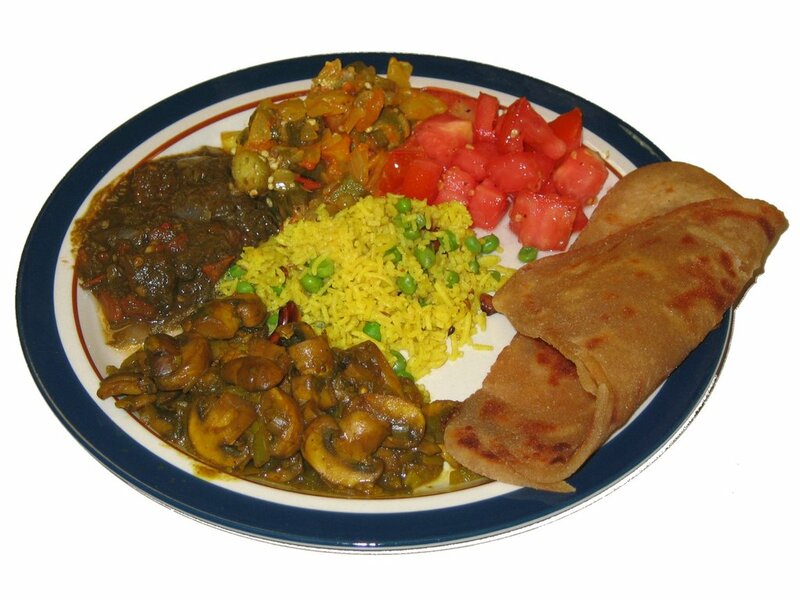 Tonight was the last night of the 6-session 3-hour ethnic vegetarian cooking class that I teach. My students made food of Thai and Indonesian origin/influence. Their Indonesian Stew was excellent; it included a homemade curry paste, vegetables, and pasta (thin rice noodles, which we didn't have, could have been another option). Their Indonesian Tempeh and Vegetables was quite tasty - how could you go wrong with sauteed tempeh in (reduced fat, organic) coconut milk?! They also made tomato (with Ume plum vinegar) and cucumber salads and Thai Jasmine rice. For dessert, they made ground cashew - wheat germ - whole wheat - brown rice syrup - based round cookies with vegan chocolate chip cookies. Yummy - many of the students rated tonight as the best food of the class. Tonight I saw that I had a few Brussels sprouts and sweet peppers needing to be cooked, so I made a simple side dish saute of them along with shallots. A few days ago, I purchased Colgin Liquid Smoke, clearly marked as vegan, and I used it for the first time by adding some to the saute, as well as fresh rosemary. I wanted to experiment with amaranth, an 8000-year-old grain that is a nutritive powerhouse, including being a great source of calcium, protein, and fiber. It is often used to make slightly sweet cereals and is typically cooked in a ratio of 1 part grain to 2.5 parts simmering water in a covered pan for about 18-20 minutes till the amaranth seeds are just tender. I cooked the amaranth in vegetable broth and mixed in cooked spinach, salt, freshly ground black pepper, and a Caribbean hot sauce. I was wondering if we would find it a little bland, but my wife and I enjoyed the dish; the seasoning was just right to check the grain's natural sweetness and I liked how the grain mixed right in to the spinach. I'd like to work with amaranth again in the near future, perhaps combining it in a stew. We enjoyed how we ate avocado tonight, cubed with heirloom tomato, freshly squeezed lime, fresh oregano, and a touch of salt and freshly ground black pepper. Dinner was rounded out with a wheat English muffin topped with vegan "ghee" that my students made last week by clarifying Earth Balance. I was delighted that Susan of the FatFree Vegan Kitchen blog featured my blog day the before yesterday (Saturday). Unfortunately, though, I wasn't blogging over the weekend. On Friday, we quickly met our good friends who moved today to get some kitchen supplies that they didn't pack; they convinced us to join them for some falafel, salad, and spreads at International Delights, though I was already planning some home cooking. On Saturday, we went to a vegetarian society potluck dinner / vegan chocolate fondue party; I made my "Dilip’s Lime Seitan Sticks" with seitan sticks marinated in organic Baja Lime marinade, as I did on August 7, with fresh home-grown rosemary, fresh lime juice, turmeric and other spices, and organic mushrooms (champignon, abilone, shiitake, shimeji). Yesterday was the surprise going away party with more than 30 people that I organized for my friends who are moving; I arranged raw and cooked appetizers, mango juice, and a wheat dessert for $6, and everybody could order main courses from the menu (I had a spring masala dosa, one of my favorites) at Tower South Indian restaurant. I was surprised several days ago to find butternut squash, a winter squash, at my local coop - and some of the smallest ones I've seen. I prefer small squash as it cooks faster. 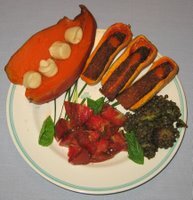 I had this idea of baking the squash and serving it with smoke-flavored organic "fakin' bacon" strips of tempeh and perhaps other vegetables, similar to a course I made at the last wedding that I catered of tempeh and vegetables stuffed within acorn squash, and topped with melted vegan "cheese". I preheated the oven to 375°F and baked sweet potatoes for about an hour (normally, allow 40-70 or 80 minutes, depending on the size; when done, the potato should give with pressure). I prepared the squash by cutting in half and spooning out the seeds, then baking for about half an hour (I added it to the oven half an hour into the sweet potato bake time). In the meantime, I sauteed the smoke-flavored tempeh in very little oil in a cast iron pan. I served the tempeh simply atop the tiny squash, and dabbed it with some Indian chutney that we got last Friday at an Indian restaurant. It was surprisingly good, though I'd like to try this again with more normally sized squash that can accomodate additional sauteed vegetables. Marshmallows are not usually vegetarian as they are traditionally made with gelatin from animals. However, the all-vegan store Pangea (which also soon should be set to sell my cookbook!) sells marshmallows! I picked some up when I was at a conference a few weeks ago. I served the sweet potato with marshmallows in the middle. A few years ago I had good luck experimenting with cooking bananas. I was making dinner for a friend for his birthday, and served tempura vegetables. I had extra batter so decided to try something unusual, and battered and sauteed banana slices. It came out well I thought - and my friend adored it. Tonight I tried directly sauteeing banana slices to make a slightly sweet and mostly savory main course. After I had a brown and wild rice mixture going with vegetable broth in my rice cooker, I sauteed a little bit of onion for just a minute or so, then added cubed tempeh. 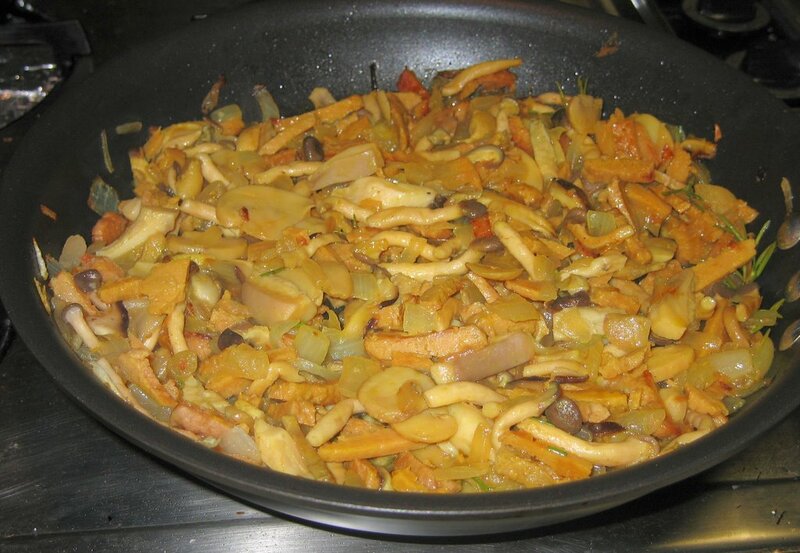 As the tempeh just started turning brown, I added sliced bananas and chopped red bell pepper. I sauteed till the tempeh was golden brown. The banana cooked down and wasn't so visible - but I thought it packed a good flavor punch and next time wouldn't add a second banana. Before serving, I spiced the dish with some Caribbean hot sauce and a dash of fresh squeezed lime (both added maybe half a minute before turning off the heat) and spices, including black salt (actually pink; the Hindi name for this sulfurous unrefined salt is kala namak), turmeric, and roasted cumin seeds. I served this all with roasted corn off-the-cob that had fresh lime, Earth Balance non-hydrogenated margarine, and salt mixed in. 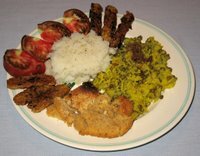 I liked the banana-tempeh main course, and my wife seemed to thoroughly enjoy it. 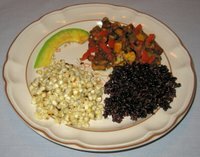 The flavors accented by the serving with an avocado slice made the dinner somewhat tropical (though the corn dissented). I would like to cook bananas again in the near future. We were away at the beach from Saturday through today, returning just in time to shop for and have cooking class 5 of 6 (we were off last week). Tonight, we made less than we usually do to give the class plenty of time to work with filo dough. One team of four made spanakopita, and the other team of four made my chocolate baklava. 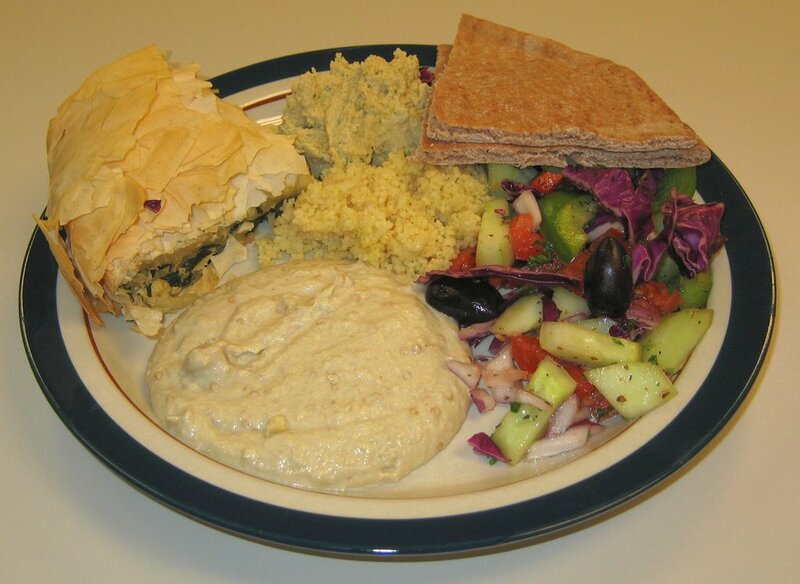 In addition, we had dips baba ganouj (made with eggplant) and hummus (made with chickpeas; both dips have sesame paste - tahini - and other ingredients, including garlic); pita bread; Greek salad (vegan as with all my dishes! ); and plain couscous. Not shown here is the wonderful chocolate baklava that my students made! Wherever we travel to, we seem to have good fortune getting tasty vegan food. This trip to the beach was a bit of an exception. Luckily, we had taken some leftovers with us and stayed at a lovely ocean-view condominium with a kitchen. On Monday, we had hoped to eat out, but were disappointed at the few choices we had. We ended up at another Thai restaurant, Thai by the Sea, but unfortunately could only get some rice paper "summer rolls" and a very uninspired cucumber salad. Though we had called in advance, we found that all of their curry sauces are pre-prepared and already have fish sauce. After our appetizers, we decided to do a quick shop and cook, or should I say 'prepare', a simple meal. It was late and we were hungry. The biggest grocery store on the island had so much processed food and a relatively small produce section (why is vegetarian dining and food on islands, which should be food havens, often in our experience not so forthcoming?! ); we ended up buying some frozen potatoes, tostada shells, and some fresh vegetables. The dinner was too simple (and embarassing :-) ) to document here - it was just tostadas, potatoes, and leftover garlic scape stirfry. Today was our first anniversary! We actually had three wedding ceremonies last year; we were officially married on August 20 and had two big ceremonies on October 15, so will celebrate an August and an October anniversary! We were away at the beach and had rented a nice condo ("Shore Delight") with a fabulous view of the beach from its two decks. Yesterday, we ate in Wilmington, NC at Rim Wang Thai Restaurant. The food was okay, but too spicy hot. Tonight, my wife thought that my home cooking, served on the deck, would be more romantic than eating out, and I was very happy to oblige. I did bring simple food ready for one night's cooking, and picked up some bread and fresh vegetables locally. Rather simple, but my wife enjoyed what I made. I sauteed canned artichoke hearts. I know, they would taste much better if they were fresh, but it was easy to travel prepared this way. I first gently squeezed each artichoke heart then placed in a napkin-lined bowl to remove moisture. I cut each heart in half and sauteed (I also brought my favorite saute pan to the condo), along with a little onion. At home I'd add a number of seasonings and sauces, but here I used fresh tomato and salt and pepper. I served this over organic Jerusalem artichoke pasta. Oh, I almost forgot - on Friday night, back home, I was preparing to make dinner when we realized that time was short as we were going to an outdoor film (the classic Lawrence of Arabia). We thought it would make more sense to order some takeout food from Tower South Indian Restaurant, and eat during the film. It turned out to be a good choice - we had two rice dishes, lentil-rice steamed idlis, spicy sambar soup, and plaintain bhajis (battered and fried plaintains) - and took some leftovers to the beach for lunches. 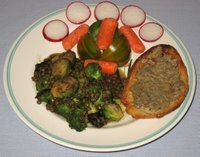 I came up with the idea of combining French lentils with grilled Brussels sprouts, and came up with a dish that my wife loved. I started heating broth in a 3:1 ratio to raw lentils to a boil (I filled a mini vegan yogurt container with lentils and put in three containers worth of liquid to boil). In the meantime in my cast iron pan with a little bit of olive oil, I grilled halved Brussels sprouts and large chunks of garlic; a few minutes after starting, I put in some broccoli crowns. Once the sprouts were browning a few minutes later, I transferred the garlic to the broth and brought to a boil. I reserved the vegetables in a bowl and put a little Merlot wine over them as a marinade. Once the broth was at a boil, I added the lentils (a third as much as there was broth) along with a pinch of turmeric and salt, covered the pan, and lowered the heat to a low simmer. 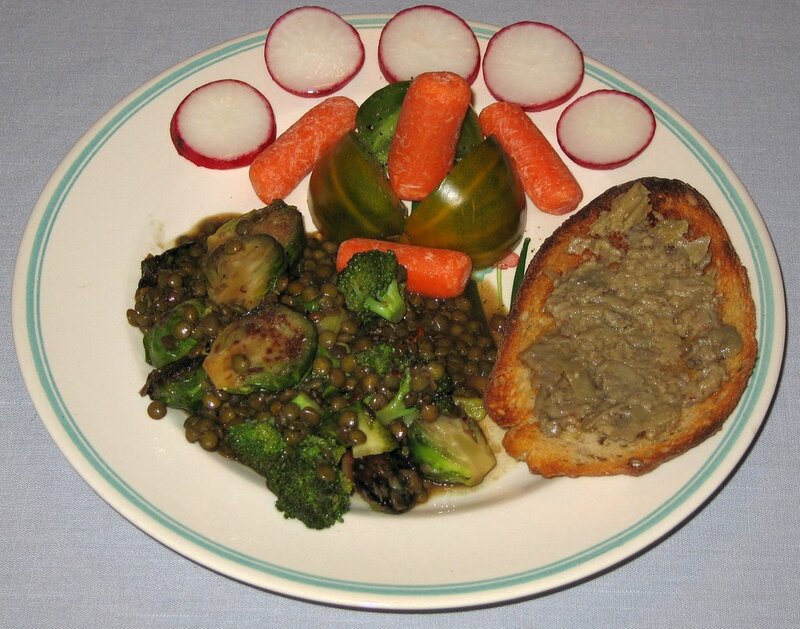 It generally takes 30-40 minutes for the lentils to soften and absorb the liquid, and one can also add some raw vegetables. What I did, since the sprouts and broccoli were cooked, is added these vegetables about 35 minutes later, allowing about 5 minutes to let the flavors mingle, including the small amount of wine marinade. Once the lentils were done, I mixed in some crushed red pepper and Kermit's Fresh Lime and Datil Pepper Seasoning. 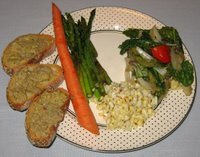 I served dinner with a heirloom tomatoes, baby carrots, radishes, and rosemary sourdough toast with artichoke tapenade. By the way, yesterday I picked up an interesting product on clearance, Volcano Lime Burst. I was a little dubious about it as its main ingredient is water, but its organic lime juice is supplemented with lime oil. I suppose I could easily make such a mixture at home as I have small bottles of potent lime oil and lemon oil. Anyway, I mixed a drink both yesterday and today to serve with dinner - Knudsen Coconut Nectar with several drops of the Burst. It was good! Last week I had purchased a pineapple that we loved eating. I saved the core to try out an idea - the tough core I don't think is edible, but I was wondering what it would do to rice or other grain. I prepared to make brown Basmati rice in my rice cooker, adding in some sauteed bell pepper and onion, as well as seasoning (pinch of turmeric and salt and browned cumin) - and pieces of the pineapple core. I started the vegetable broth - rice - vegetable - pineapple - spice mixture going in the rice cooker and made the rest of the meal. I made a simple stirfry of broccolini and roasted 3 ears of corn over the open flame of my gas range. 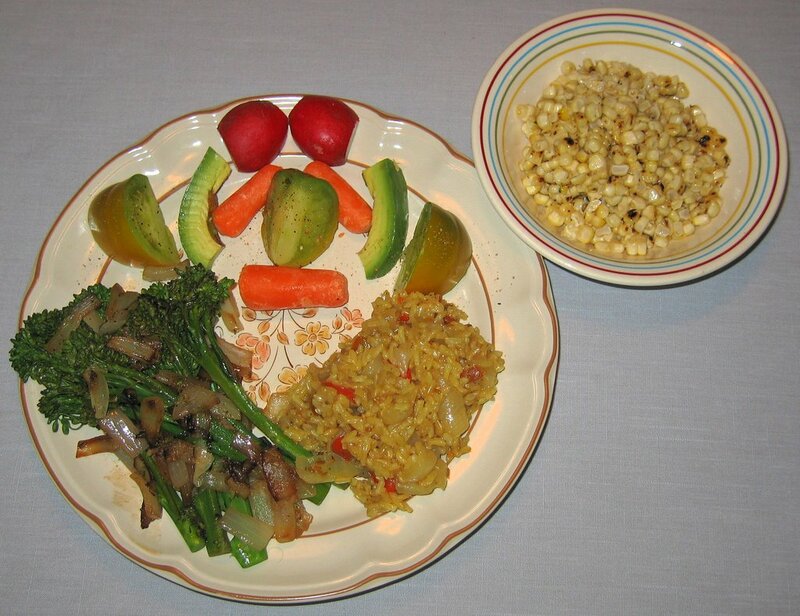 I stripped the kernels and mixed in seasonings and Earth Balance non-hydrogenated margarine - we so love fresh corn! I followed the suggestion to stirfry garlic scapes that I found back in June when I was first researching this edible flower of the garlic family. That reference suggested cutting the scapes into 2" pieces, boiling for 2 minutes, and adding to the stirfry in the final minute or two. I made a simple stirfry with potatoes, tempeh, interesting small Canadian sweet peppers I found at the store today, and onions. I prepared the scapes as suggested and in the final portion of the stirfry added a little bit of Consorzio organic Baja Lime marinade as well as a few seasonings. We liked the stirfry but the scapes were stringy - I would try it again if the scapes were very fresh or just use the bulbous ends. We were at a conference this weekend just outside of Washington, D.C. I love dining in Washington! On Friday, we went to a relatively new all-vegetarian restaurant, Vegetate; they have a small menu but the presentation is excellent and taste and quality very good. On Saturday, we ate at my wife's favorite pizzeria, Pizzeria Paradiso near Dupont Circle; they readily accomodate vegans and offer Follow Your Heart caseine-free vegan cheese. On Saturday, we had a mock crabmeat and potato dinner at the conference banquet; I liked the presentation but don't generally look for mock meats. We cycled in Washington on Monday and met up with friends to eat in Old Town Alexandria at Mai Thai - the decor was beautiful and food good but too spicy hot in spite of our asking for mild. The lemonade was excellent and I would definitely try Mai Thai again. On Monday, I had described the feast that we had enjoyed on Sunday at Café Parizäde; we were fortunate to bring leftovers home. They came in quite handy tonight - we were in a rush to leave for an extended weekend in Washington, D.C., and had just the right amount of leftovers to make two nice plates. 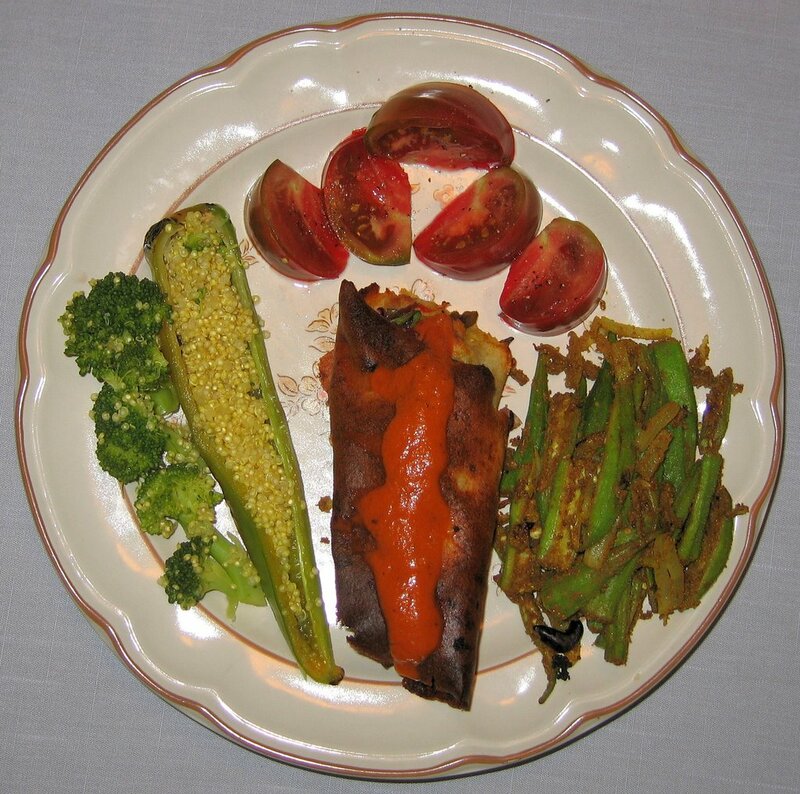 We had Chef Robert Adams' roasted corn-off-the-cob accented with smoked poblano peppers and cumin, served with a light sprinkling of lime and salt; spicy grilled polenta (how did we miss bringing the spinach & pesto it was served with at the banquet? ); garlic whipped potatoes; seared portabello mushroom; and raw spicy avocado-lime soup inspired by Chef Jannequin Bennett and that we enjoyed in late July. 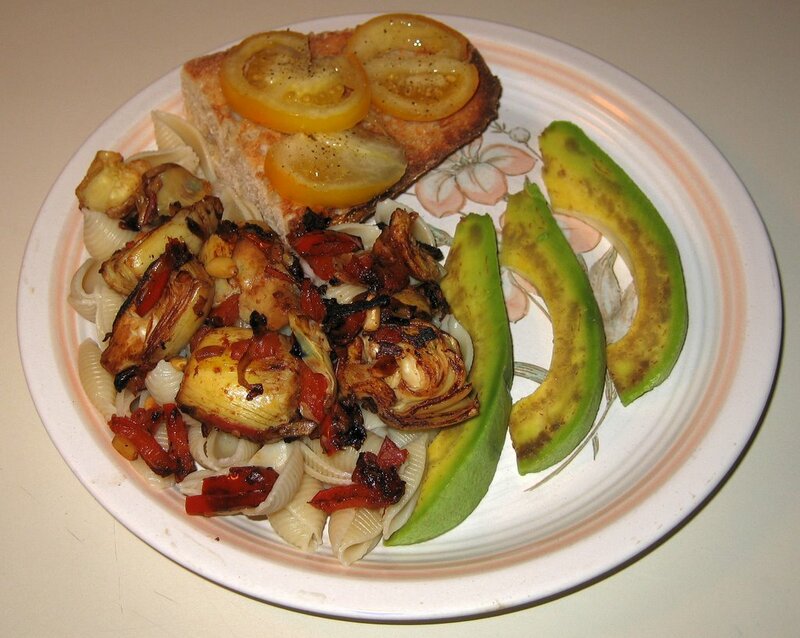 I added some fresh figs and tomatoes to round out a quick and delicious dinner. Tonight was my Indian cooking class, and my students followed my recipes to make a rice pilaf, curried mushrooms, bhindi (okra-tomato-onion side dish), palak-tamatar (spinach-tomato side dish), and my grandfather's favorite spiced tomato salad. I bought some frozen paratha (thin flat breads), which I showed my students how to heat and prepare - and to use instead of utensils to eat. We also had some of my Mom's homemade lemon pickle. Not shown here is a rice milk-fresh mango based spiced mango shake and spicy chai that we made, and the American dessert (I am not fond of Indian desserts; this used to be an 8-week class when I taught it in Raleigh years ago, and in the 6-week version American is cut) of chocolate tofu pie - made in smooth and rocky road (with walnuts) versions. Both versions included pomegranate jam - which I had not seen till recently! I had an idea a day or two ago of slicing seitan (wheat gluten) into thin sticks, marinating in a lime sauce, and sauteing, then serving over rice. 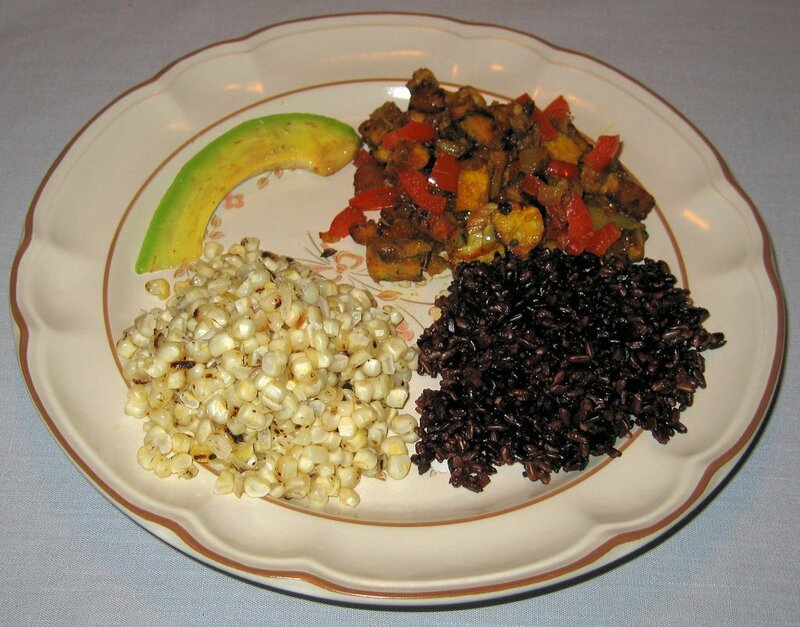 I prepared something like that today but over quinoa, which I haven't made for some time and which I thought would provide a nicer looking backdrop than darker colored whole-grained rices. 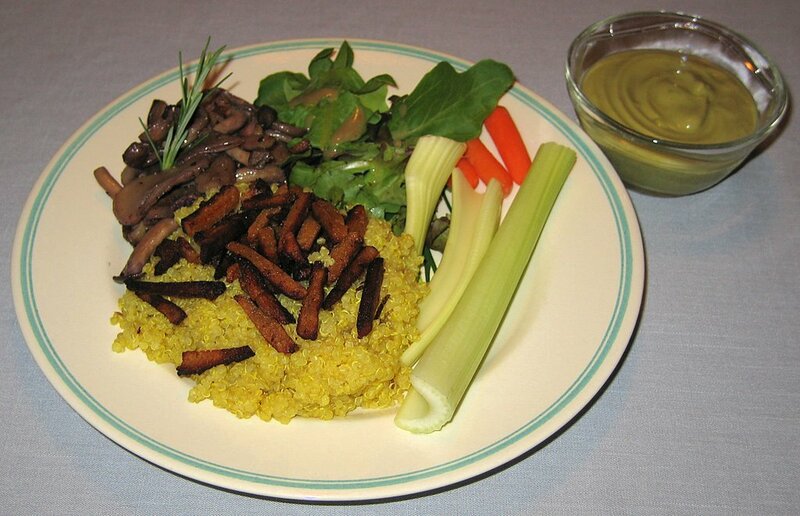 My wife and I loved the seitan and I intend to prepare it in this way again, experimenting with serving it with roasted potatoes and in other dishes. I started by slicing the seitan and pouring Consorzio organic Baja Lime marinade, as well as some ginger and a little garlic, over it. I let it sit for about 3 hours, poured off the marinade, and sauteed the seitan till it was nice and crispy, maybe 6-8 minutes. I then transferred the seitan to a paper towel to absorb excess oil, and put the mushrooms into the pan. I sauteed the mushrooms for a few minutes, and added some red wine, home grown minced herbs, and seasonings just before the mushrooms were cooked. I made a simple quinoa dish in parallel. I put a tiny amount (1/2 teaspoon?) of canola oil in a pan and heated it; I tossed in some cumin seeds and sauteed them for about 20-30 seconds, stirring and ensuring the seeds didn't get too browned. I then added quinoa and twice as much water (I could have used broth, but wanted the seitan and lime flavor to shine through), as well as a pinch of turmeric, brought to a boil for 3-5 minutes or so, then turned the heat off, covered the pan, and let it sit for 10-15 minutes. I served the seitan sticks on top of the quinoa and (after I took the picture) put a little hot sauce on top. In consonance with the lime marinade, I put a little Thai Sesame Lime dressing /marinade from Drew's on some lettuce leaves. I served some fabulous leftover raw avocado-lime soup from a feast at Café Parizäde that we had yesterday to round out the dinner. That soup, which I served leftovers of tonight, was inspired by the amazing Spicy Avocado-Lime Soup of Chef Jannequin Bennett's (though my wife liked Chef Robert's even more!) 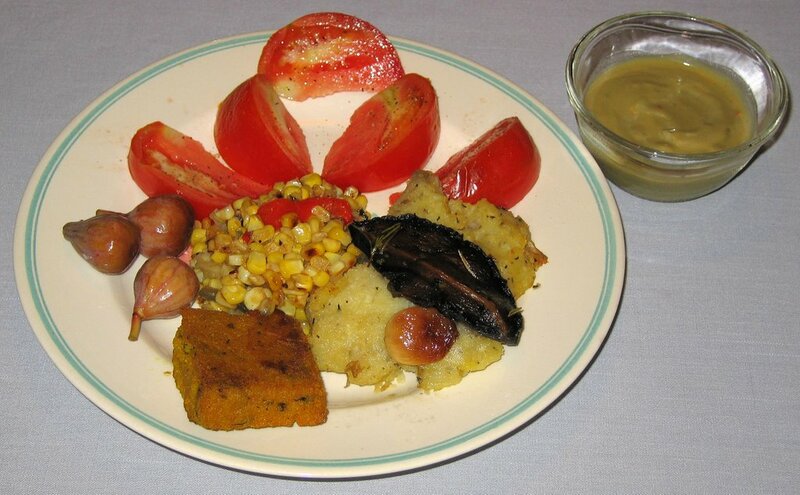 that we had last Sunday at the five-course vegan rawfood meal at The Jefferson Hotel in Richmond. I asked Chef Robert at Parizäde if he could make a soup like that, and boy, did he succeed! 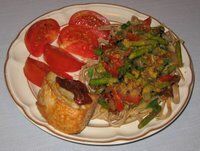 It was creamy and delicious and - like all the other menu items - vegan! We also had fresh seasonal fruits (strawberries and peaches), and coconut milk-based fresh peach cake with raspberry frosting. What a dinner! Tonight my wife was performing, opening a concert of Jaafar Music's, a group rated the best international group in the area for the last two years. She wasn't going to eat before the performance but we went out afterwards for her to get some light fare. 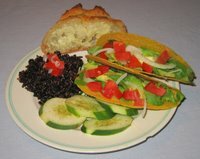 I made for myself several tacos filled with avocado, locally grown tomato, lettuce, and sweet Vidalia onion. I am having a few friends over for brunch tomorrow and bought Weaver Street Market's amazing Lemon Sourdough Boule - but couldn't help having a piece of it tonight. 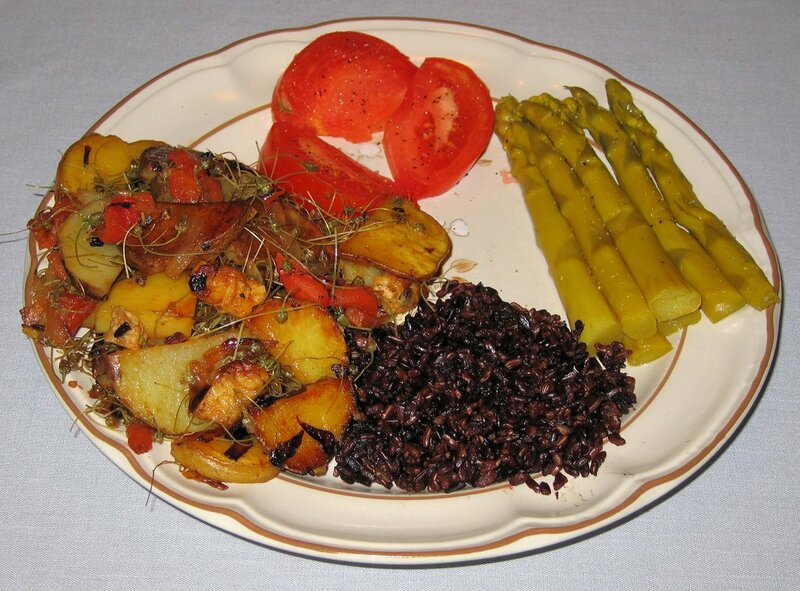 I also made some brown and wild rice in vegetable stock. We had some leftovers to finish, so I reheated the kichidi that I had made on Monday and the cornbread that my students had made on Tuesday. I also sauteed some tempeh then dripped a little bit of soy sauce on the strips, and made mashed potatoes. My wife had eaten a little earlier while I was out as she had to go out to practice her musical instrument tonight, so she had the leftover fettuccine with asparagus from Wednesday instead of the potato. It was getting late and I wanted to get a simple, quick, and tasty dinner on the table. 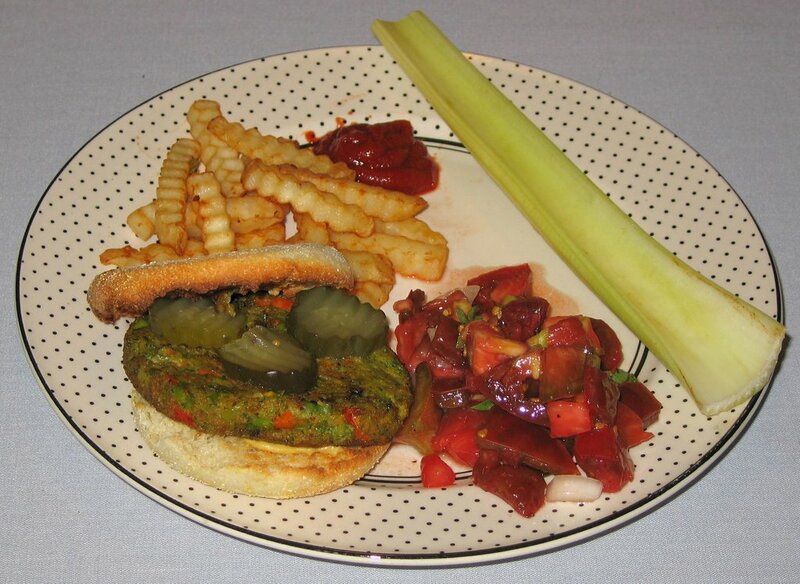 Earlier today I had purchased Dr. Praeger's California Veggie Burgers. I haven't had any of Dr. Praeger's products before. I served it on an English muffin with dill pickle slices and champagne dill mustard. We loved the burger! It was moist and fairly unique - I don't remember ever eating a burger with this flavor. It has a great combination of vegetables and oat bran as the primary ingredients*. I also made an heirloom tomato salad with sweet Vidalia onions, rosemary vinegar, homegrown herbs, and seasonings. 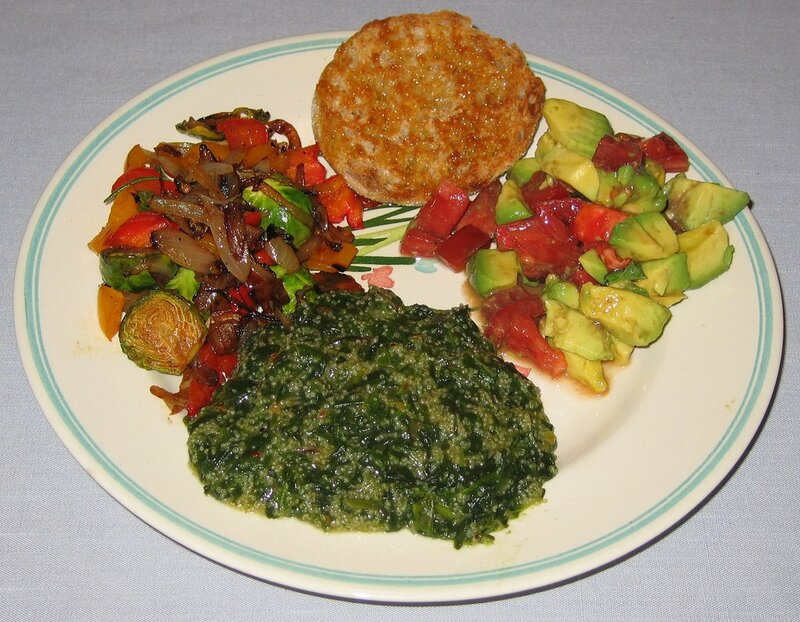 The plate wasn't my prettiest (I should have served the tomato salad in a small bowl) and the meal wasn't the most elegant or filling (I actually had an additional English muffin with Earth Balance®), but it was tasty, nutritious, and fast! I sauteed some asparagus, onion, and bell pepper and served it over Hodgson Mill organic whole wheat fettuccine with milled flax seed, sprinking some freshly ground black pepper and vegan Parm! "parmesan cheese" on top. I also had some sourdough bread, lightly toasted, with sundried tomato. I made a lot of food - my wife could only get through about half of her giant serving, so will enjoy the other half in the coming days. Tonight in class my students made a nice Mexican meal. The fajitas were seitan-based, and the cornbread had fresh corn kernels in it. We were away this weekend and, we think because of her travel most of last week, my wife ended up not feeling well yesterday. 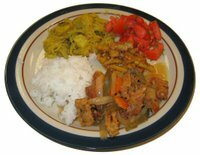 I wanted to make something bland like the BRAT (Bananas-Rice-Applesauce-Toast) diet for those with an upset stomach, and was going to make white rice and steamed vegetables, but she was in the mood for the Indian kichidi, which I've never made. 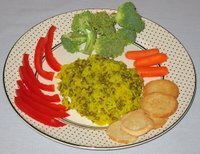 With some guidance from her, I put together this simple rice-lentil dish, and served it with raw foods and plain melba toast. 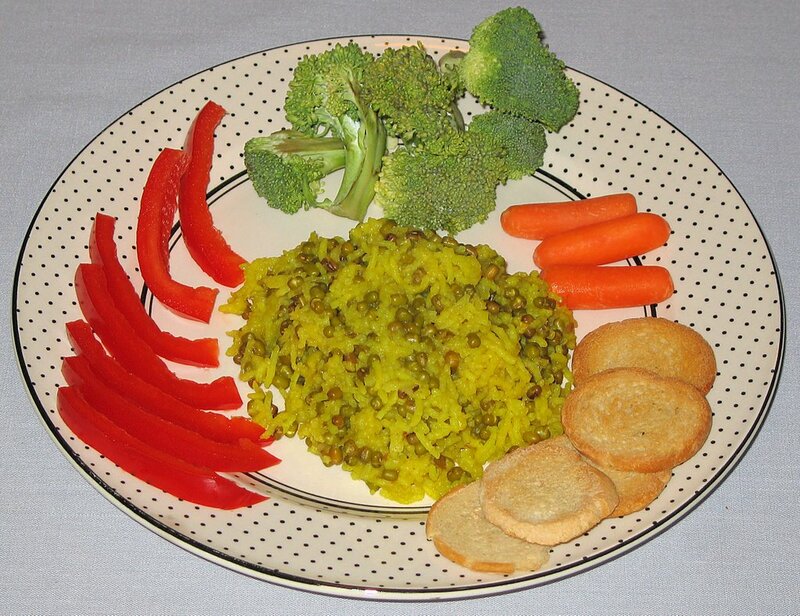 I used equal parts of white basmati rice and green moong lentils, and twice that amount of water. First I put a little bit of canola oil in a pan and, once hot, added a few pinches of cumin seed and the rice. I stir fried for a minute or so, then added the lentils, water, pinches of turmeric, salt, and dried cilantro powder and brought it to a boil. I reduced the heat to a simmer and cooked for about 20 minutes. If I didn't want to make this dish bland, I could have included some garlic in the initial stir fry; I did add some spicy lemon pickle to my serving at the table. This past weekend, I was a speaker at the fourth annual Richmond Vegetarian Festival, about 3 hours from home. It was a well-attended event with over 3000 people in the lovely Bryan Park. We ate with several friends that evening at Bottoms Up Pizza; I thought the pizza was passable but not great. But yesterday we had a very nice gourmet meal! There was a special "Celebration of Summer" 5-course vegan rawfood meal at TJ's Restaurant in Richmond's ornate historic The Jefferson Hotel. The executive chef there, Chef Jannequin Bennett (author of Very Vegetarian), is a vegan and enjoys putting on these special events. We had Spicy Avocado-Lime Soup (which was one of the best soups I've ever had! I should learn how to make something like this), Jicama Salad in Watermelon Cage (nice presentation and tasty), Parsnip & Carrot Linguine with Mushroom Miso Sauce (it was okay but not great), and Ginger Coconut Mousse with Fresh Berries (nice). 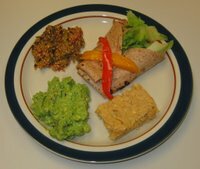 It's been a long time since I've had a gourmet raw food meal, and it was a treat.